Within 7 day motorbike ride, the Northeast Vietnam motorbike tour show you the best attractions in northeast of Vietnam such as Ba Be lake – the largest natural one in Vietnam, Ban Gioc waterfall – the biggest and most beatiful one in Vietnam; besides you’ll have chance to kow more about Ho Chi Minh’s life and works during the first days when he had just come back to Vietnam after studying and working oversea by visiting some historical vestiges nearby Cao Bang. This is one of the best in our Vietnam motorcycle tour collection. Start the great motorbike tour in northeast Vietnam at about 8 am. Before enjoying riding on an winding road up to peak of Mau Son mountain in Lang Son province, We should be ready and careful to get out of busy Hanoi, after around 1,5 hour riding motorbike slowly like floating on the river with other local scooters to be out of the city, we’ll be in the countryside with the scenic and safe roads then start to enjoy this Vietnam motorbike tour. Mau Son is a mountain peak of over 1.500 metres above sea level with a stunning view and It was ravaged during war with the Chinese and the buildings have recently been rebuilt in traditional style. It could be great experience to stay here overnight. After saying goodbye to Mau Son, we’ll enjoy a great motorbike tour to Cao Bang, with the ride mostly on the mountain passes and crossing villages, it’s really a memorable day of this Northeast Vietnam motorcycle tour. Getting down from the peak of Mau Son, skirting the border city of Lang Son, visiting the Dong Dang ‘Friendship Gate’ on the Chinese border, then we join the legendary ‘Highway 4’ where the Viet Minh forces carried out numerous raids over uncountable passes in this remote border region. 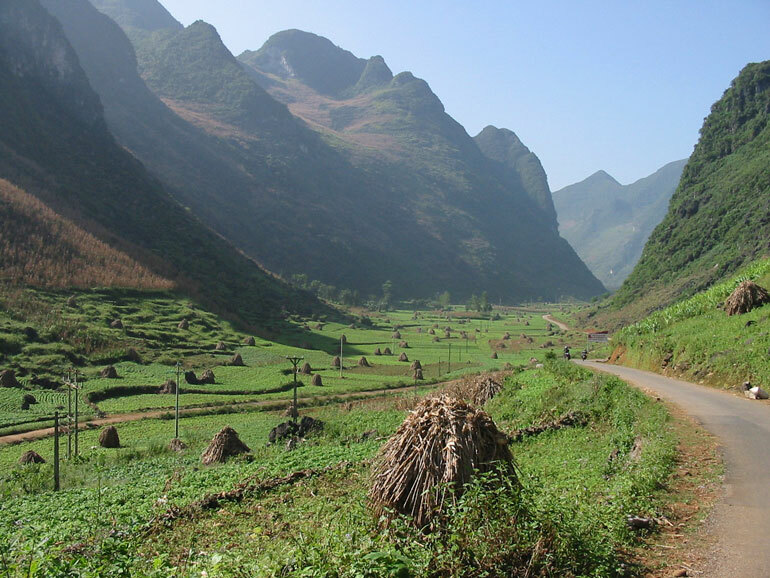 We follow the border all the way to Vietnam’s major city in the north-east: Cao Bang – ‘High Plateau’ . Overnight in Cao Bang. * Cao Bang: At 300 kilometres north of Hanoi, Cao Bang is used as a base camp for all our expeditions to destinations close to the Chinese border. The region north of Cao Bang is dominated by limestone. Hence its scenery is similar to that of Ha Long Bay or Guilin (China) and offers unprecedented driving enjoyment amongst some of the most spectacular surroundings in Vietnam. We explore into the magical region of the far north-east with its impressive limestone karst scenery. We meander around and through the countless rock monoliths all the way to the huge Ban Gioc Waterfall which sits on the Chinese border. 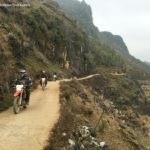 The motorbike ride is up and down crossing small mountain passes and through some rustic villages of the local hill tribe so it must be the highlight of this motorcycle tour in Vietnam. After lunch and enjoying the amazing view of the fall, We can swim under the falls and picnic on bamboo rafts. Then in the afternoon we loop back to Cao Bang past even more spectacular karst scenery. Overnight in Cao Bang. 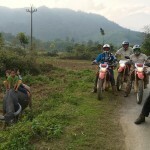 The scenic ride today is the highlight of this 7 day motorcycle tour North Vietnam. * Ban Gioc Waterfall: In this closed off region, where thousands of limestone monoliths loom high above paddy fields tended by Nung, Tay and Green Hmong peoples, you will find sealed, winding roads which make for excellent driving. The entire area rewards those willing to take the time to explore and share life with its people. In the morning we strike north-west to the border, marked by a massive range of peaks, and pass over to Pac Po Cave where Ho Chi Minh made his return to Vietnam in 1941. Then we head straight up on challenging road, pass through deep, remote karst country and rest at a secluded lake deep in the forest. Late afternoon ride on sealed road back to Cao Bang and a soothing massage. Overnight in Cao Bang. * Pac Bo Cave: North-West of Cao Bang and right up along the border with China, the cave is well known for having been the first refuge of Ho Chi Minh on his return to Vietnam in 1941. At the point where the famous Lenin Stream cascades down a waterfall from China, we will continue by foot to penetrate into the mystery of Vietnam’s Independence Movement and its surrounding jungle. * Ba Be Lake: This pristine mountain lake, arguably Vietnam’s most beautiful lake, is situated 240 kilometres north of Hanoi. Surrounded by primary jungle and limestone cliffs, the surrounding areas are inhabited principally by Thai and Hmong peoples. A day to explore at Ba Be Lake, take in some markets, enjoy a boat cruise, go fishing, explore caves, dine with friends at the edge of a waterfall, enjoy the hospitality of the minority peoples who inhabit this area. We will take a boat up the seven-kilometre length of the lake to the Dau Dang waterfalls on the Gam River and also visit the 300m Long Phuong Cave. During the war the cave was one of the rare natural shelters for the local population hiding from the bombing. Overnight with a family in a Tay minority stilt house on the shores of the lake.